FILE - In this Nov. 24, 2018 photo, demonstrators, wearing 'yellow vests,' march on the Champs-Elysees in Paris, France, as they protest the rising of the fuel prices. A year ago a British magazine pictured Emmanuel Macron fresh from his stunning presidential election win walking on water. The Economist saluted him as the European leader most likely able to counter rising populism across the continent. The magazine wasn’t the only one placing hopes in France’s energetic, telegenic young leader who defied conventional French political norms to create from scratch a centrist political movement, La Republique en Marche. FILE - Emmanuel Macron, then-candidate for the 2017 presidential election, attends a campaign rally in Albi, France, May 4, 2017. His victory was touted as an object lesson by Europe’s embattled centrist politicians in how to take on Euro-skeptic populists and reconnect European governance with the people. But now he is learning how difficult it is to govern the country. Just like his predecessors in the Élysée Palace: Nicolas Sarkozy who promised dynamic Thatcherite reforms only to fail, and socialist Francois Hollande who equally found France impervious to major change, say analysts. What went wrong, and what next for Macron, who had pitched himself as the antidote to the "illiberal democracies" of Central Europe and the defender of the European Union? Analysts say impatience was among his key mistakes, rushing in to change things, rather than taking a more methodical and gradual approach. 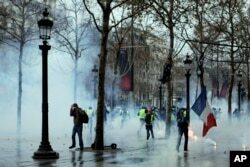 During the weekend, the fifth in a row "yellow vest" protesters battled riot police in the streets of Paris, the Élysée Palace took some comfort from the drop in the number of demonstrators against Macron’s financial and social policies. Demonstrators run away through tear gas during scuffles on the Champs-Elysees, Dec. 15, 2018, in Paris. Protests throughout the day against France's high cost of living by "yellow vest" demonstrators were largely peaceful. Opinion polls suggest overall support for the movement has dropped, with the French evenly divided over whether the Yellow Vests should continue their agitation. But across France tens of thousands still took to city streets vowing they won’t give up, despite Macron's bid last week to buy them off with a costly package of fiscal measures to boost pay packets and pensions. 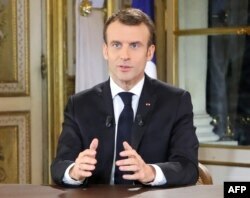 French President Emmanuel Macron speaks during a special address to the nation, his first public comments after four weeks of nationwide 'yellow vest' protests, Dec. 10, 2018, at the Elysee Palace, in Paris. His sweeteners included canceling planned fuel tax hikes, the immediate cause for the protests, a rise in the minimum wage, tax relief for pensioners and the scrapping of taxes on overtime work starting next year. 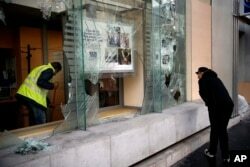 FILE - A worker clears debris in a bank as a man watches through smashed windows, in Paris, Dec. 9, 2018. Economists estimate the entire package will cost the French government around $17 billion. His aides argue the package was the cause for the fall-off in the numbers of protesters. Some analysts agree. 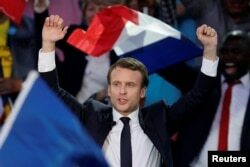 “I think one of the key factors is that we had the Macron speech, the big address to the nation... That was important: he took a lot of ownership for the problems, he admitted mistakes, and he legitimized the protesters’ complaints, and he introduced some tangible measures to remedy them,” British academic Andrew Smith told France 24. But others say fatigue, the frigid weather and the fast approaching holiday season all contributed too. And they warn the visceral dislike the "yellow vests" hold for Macron remains. “People have confidence in themselves now, so things won’t return to how they were,” according to pollster Jérôme Sainte-Marie. Few observers believe the rebellion is over and Macron is close to defusing the first real crisis of his presidency. They say the French president will have to change the way he governs. The 40-year-old former investment banker is seen widely as being haughty and out-of-touch with the daily struggles of ordinary people. The "yellow vests" have dubbed him “the president of the rich” and observers have noted their deep animosity to the French leader. The initial protests over the government’s decision to raise taxes on fuel have been over taken by a much broader grievance against policies the "yellow vests" say have hurt the poor and ordinary workers, and enrich the wealthy. Macron has declined to reinstate a wealth tax he scrapped soon after coming into power. A major opinion poll published Sunday in Journal du Dimanche newspaper showed Macron’s approval slipped two points in the past four weeks to 23 percent. Other polls have his approval rating even lower at 20 percent, and it remains unclear how he can claw his way back. FILE - French Finance Minister Bruno Le Maire speaks during a news conference about the situation with Renault, at the Bercy Finance Ministry in Paris, Nov. 21, 2018. That is going to be a hard to pull off, with the government looking to recoup some of the costs of the financial sweeteners Macron announced last week. 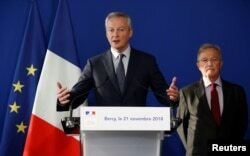 Le Maire insists government spending cuts are needed to compensate for the package.